Launched on 4 August 2007 by a Delta II rocket from Cape Canaveral, the American Phoenix Mars Lander probe landed on 25 May 2008 at 00h33 UT near the Martian Arctic circle to search for traces of water and possibly the presence of existing or previous life. This static probe was a basic lander which could not move. However, NASA fitted it with a long robotic arm that could dig through the frozen ground to take samples for the analysis instruments installed on the platform, thereby being the first real biochemical laboratory ever sent to the Red Planet. Phoenix was operational for half a Martian year (just over two Earth years). It was retired on November 10, 2008 after engineers lost communication. It concentrated its efforts over sites where Mars Odyssey had detected vast concentrations of ice. It excavated the soil looking for recently formed volatile substances (organic matter) and could detect features down to 10 nanometres. Its scientific instruments were able to analyse Martian rocks and atmosphere. 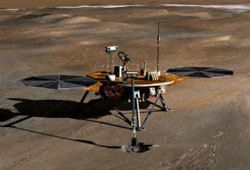 The Phoenix Lander was designed around the platform initially planned for Mars Surveyor in 2001 and abandoned following the failure of the Mars Polar Lander in 2001, the main features of which it shared together with much of the instrumentation. It weighed 55 kilograms, had a diameter of 1.50 metres and a span of 5.50 metres with the solar panels fully deployed. The lander was the first automatic probe in the NASA Scout programme, a series of low-cost missions using the "'faster, better, cheaper" concept designed for cost reduction but which were mostly failures. Scout was ended in 2010. The Scout programme did not, on the other hand, make savings on the resources used, but was developed in line with the results obtained by previous missions and the most recent discoveries. It was hoped that this approach, based on recent results rather than on a long term programme, would optimise research programmes while reducing deadlines and costs. This arm carried a small shovel to a distance of 2.35 metres from the probe, which could dig a trench 50 centimetres deep and collect samples for analysis. A miniature camera mounted on the end of the arm that could send high resolution images of what the shovel was collecting and of the trench walls. An instrument inherited from the Mars Pathfinder and Mars Polar Lander probes, but improved by fitting the sensors used by Spirit and Opportunity. Like the previous two, its two lenses were fitted with filter wheels making it possible to obtain images at 12 different wavelengths, from violet to near infrared, from a static position 2 metres above the surface. The LIDAR, a laser emitter running at two different wavelengths in the near infrared. Pointing upwards, it emitted pulses (2500 per second) of which the echo was received after being reflected from atmospheric clouds of ice crystals or aerosols up to a height of around 3 kilometres; it could measure the height to an accuracy of 10 metres. An instrument mast carried the atmospheric pressure and temperature sensors and the anemometer. The TEGA was identical to the instrumentation previously put on board the Mars Polar Lander. For the first time since the Viking probes in 1976 there was to be a search for organic compounds in the soil of Mars. TEGA was composed of eight tiny single-use furnaces, each the size of a ballpoint pen cartridge. It carried out scanning calorimetry and mass spectrometric analysis of soil and ice samples. This was the most complex experiment carried by Phoenix. It included several instruments or sets of instruments designed tor analyse numerous properties of the Martian soil and subsoil. This wet environment laboratory was equipped with four small containers ready to receive samples taken from the surface. A sample was collected by the robot arm and placed in a container containing a leaching solution. The containers were shaken for about one day following which a set of electrodes measured the presence and concentration of various solutes. One of two optical microscopes similar to those used in all science teaching laboratories, with a resolution of 4 microns per pixel. The second microscope, called FAMARS, ran using the atomic force principle. Unlike optical microscopes, this one did not work by observing the light reflected or refracted by the specimen, but by "feeling" the surface with a mechanical probe. A thermal and electrical conductivity probe was fixed to the end of the robot arm. Its purpose was to accurately measure the electrical and thermal conductivity of the soil during the trench digging.